6:15 PM: Click! Design That Fits (4540 California SW; WSB sponsor) shares that photo of artist Ryan McAbery, as the Valentine’s Day West Seattle Art Walk begins. Full info in our daily calendar highlights, including the venue map/list. More Art Walk coverage to come! 7:15 PM: We decided to visit a couple spots south of The Junction – above, that’s Ben Viscon pouring at Viscon Cellars (5910 California SW; WSB sponsor). Since the snow aftermath is still rocking people’s worlds, his scheduled artist and chocolate-maker weren’t there after all, but his award-winning winery has libations for you until 8 pm. 8:49 PM: Out late? Canna West Seattle (5435 California SW; WSB sponsor) has a group show at its Canna Culture shop across the street, including the work you see above. 6:35 PM: “Sweet Christmastime,” to the tune of “Sweet Caroline,” is what the Silver Belles were singing when we found them in The Junction, where they’re scheduled to roam until about 8 pm, in honor of both Shop Late Thursday and the holiday West Seattle Art Walk. Her photography, including Northwest rock icons of the ’90s, is on display at Easy Street all month long. 7:58 PM: Back in The Junction, Click! Design That Fits (4540 California SW; WSB sponsor) is open until 9 tonight. He’ll be back in The Junction tomorrow afternoon, for photos at HomeStreet Bank (41st/Alaska; WSB sponsor), 3-6 pm. One more Shop Late Thursday before Christmas. Two weekends, too! Lots of local independent retailers, in The Junction and beyond. SANTA BUS ENCORE! Missed the Santa Bus hosted by Quail Park Memory Care of West Seattle (WSB sponsor) last Sunday? Or, had so much fun you want to do it again? Also 10 am-2 pm this Sunday, also at the south end of the market, another round of free rides! HOLIDAY ART WALK: 5 pm “until late” on Thursday (December 13th), this is a fun night to browse and buy art, and enjoy food and drink specials. The official West Seattle Art Walk website has the previews. MURAL UNVEILING: At 6 pm Thursday, be at the breezeway (west side of California SW between Puerto Vallarta and Northwest Art and Frame) for the unveiling of the community-created Summer Fest mural! Artist Stacey Sterling will be there. SHOP LATE THURSDAY: Also Thursday night – second-to-last Shop Late Thursday – here’s a preview of which businesses to visit! The Silver Belles will be caroling 6-8 pm, so keep an eye (and ear) out for them, too. CASPAR BABYPANTS: Saturday night (December 15) at 6:30 pm, Verity Credit Union (WSB sponsor) presents the family-rock powerhouse at Easy Street Records (California/Alaska), free admission. Check the WSB West Seattle Holiday Guide for even more holiday happenings! As previewed this morning, it’s West Seattle Art Walk night! Every West Seattle Art Walk is cool – but you will want to make sure you don’t miss the next one, the Holiday Art Walk, December 13th! Here are this month’s highlights! Venues spotlighted in that roundup include Verity Credit Union (with painter Chris Kelleher, 4505 California SW); Click! 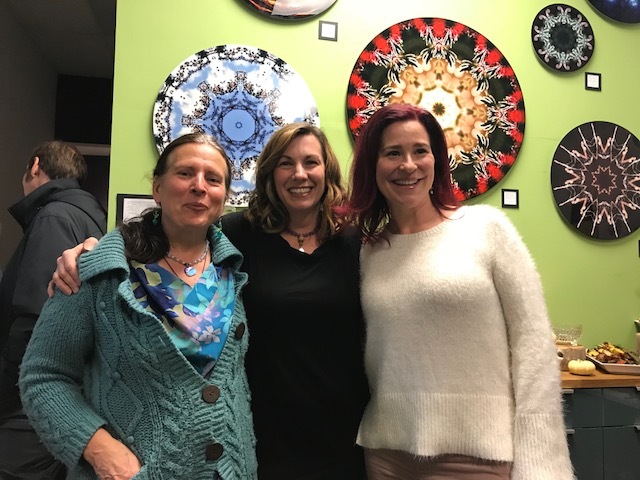 Design That Fits (“A Jewelry Invitational,” 4540 California SW); Wallflower Custom Framing (artist Tara McDermott, 4735 42nd SW); Viscon Cellars (artist Megan Simmons, 5910 California SW). AS ALWAYS, YOU’LL FIND EVEN MORE … by browsing our complete calendar. BIG day/night ahead! First, West Seattle Summer Fest Eve, with street closures in The Junction starting as soon as 4 pm, so festival setup can begin. It’s also become a fun night for locals to wander – and this time, there’s more than ever. CHALK ART: At the locations on the map below, you’ll find chalk artists starting at 6 pm – you’re invited to join them! BUBBLEMAN: The popular performer will be at California/Alaska starting at 6:30 pm. YADDA YADDA BLUES BAND: They’re playing outside West 5 (4539 California SW; WSB sponsor) starting at 7 pm. Note that some venues have artists, some have food/drink specials to enhance your Art Walk night, some have both! It starts at 5 pm and goes “until late,” depending on the venue. This month’s highlights are listed here, including the Art Walk debut of Verity Credit Union (4505 California SW; WSB sponsor), where artist Sarah Ghanooni and musician Gretchen Yanover will be featured 5:30-7:30 pm. Also, Click! Design That Fits (4540 California SW; WSB sponsor) will host Erica Gordon of Steel Toe Studios, 5-9 pm. Remember that, as you can see on the list/map, Art Walk stretches beyond The Junction – for example, Viscon Cellars (5910 California SW; WSB sponsor) is a regular participant, waiving tasting fees for Art Walk’ers, and this month featuring artist Debbie Bianchi 6-9 pm. What else is up today/tonight, you ask? LOW, LOW TIDE: Just minutes before we published this, today’s lowest low tide bottomed out at -3.3 feet. Until 12:30 pm, you can meet up with Seattle Aquarium volunteer beach naturalists at Constellation Park (63rd SW/Beach Drive SW) and Lincoln Park (near Colman Pool). COLMAN POOL CLOSED TODAY … to the general public. Swim-meet closures continue through Saturday (July 14th) and the pool will be back to its regular schedule Sunday (then two more closure dates, July 20-21). SO MUCH MORE … just go see our complete calendar page! West Seattle Summer Fest Eve to bring art into and onto the street – want to be part of it? | Comments Off on West Seattle Summer Fest Eve to bring art into and onto the street – want to be part of it? We are looking for artists to take it to the streets and create chalk art for our July 12th edition of the West Seattle Art Walk. We’ll be closing down the street in preparation for Summer Fest, the biggest party of the year! We’ll provide the chalk, the space, and promotion on social media; you will provide your artistic talent. Artists will be drawing on the streets from 6-8 pm. We will select up to eight artists and close submissions on July 6th with jury-selected artists notified on July 9th. If selected, you may bring up to five original pieces of your art as well as your business cards to display next to your work. HOW TO APPLY: Email wsartwalk@gmail.com with your name, website, two JPEGs of your work and primary social media handle. Stay tuned for more details of Summer Fest Eve – as well as the festival itself! 6:16 PM: It’s on! You are invited to get out and enjoy the June 2018 West Seattle Art Walk right now. We featured this month’s map and venue list in our daily preview – one of this month’s featured venues is Click! Design That Fits (4540 California SW; WSB sponsor), with three watercolor artists in the house tonight, and Click! shared the photo. Remember that food and beverage venues are on the list too, some with specials you can enjoy while out on the Art Walk. More to come! CAPERS has been in business for 33 years! 7:30 PM: Also in The Junction, Graystone Mortgage in Jefferson Square is featuring art by Chief Sealth International High School students – including Tuvy! Next month’s Art Walk – always the second Thursday – is June 14th. We first reported back in February that proprietor Tracy Cilona was moving her gallery/store around the corner to 4537 California SW – and now she’s there! AT CLICK! Salyna Gracie is drawing quite a crowd at Click! Design That Fits (4540 California SW; WSB sponsor) with her “Poisonous Beauty” paintings. If you can’t get to Click! in person, her paintings are available in their online store, too. 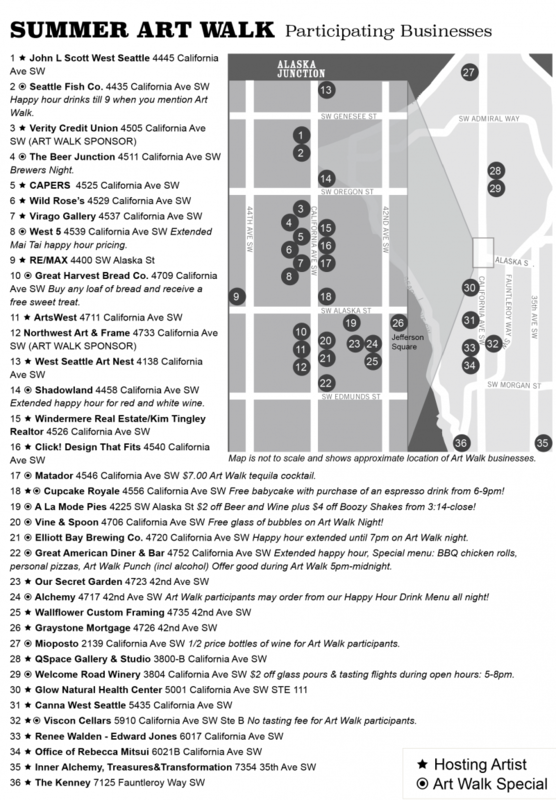 That’s the venue list and map for the spring season of the West Seattle Art Walk – second Thursdays in April, May, and June. Take a look to plan where you will stop tomorrow night starting at 5 pm – some venues have art, some venues have food/drink specials, some have both! You can preview many of the venues and artists via this update on the Art Walk website. West Seattle Thursday: Mayor @ Chief Sealth IHS; March 2018 Art Walk; more! | Comments Off on West Seattle Thursday: Mayor @ Chief Sealth IHS; March 2018 Art Walk; more! ZEKE BRUCKER: Showing at Locöl (7902 35th Ave SW) and will be there – beer specials, too. THERE’S A LOT MORE – just browse our complete-calendar page to see! 6:28 PM: Thanks to Click! Design That Fits (WSB sponsor) for the photo – they’re hosting Portland artist George Perrou tonight, for the February 2018 edition of the West Seattle Art Walk. As we mentioned in today’s daily preview – where you’ll also find the venue map/list of every venue participating tonight – George’s work is also on this quarter’s official Art Walk poster. Stop by and say hi sometime in the next few hours! Above, Quinn Fitzgerald; below, Arwen Blazier. The students’ work, comprising an exhibit titled Visual Narratives, will be up at ArtsWest through this weekend. WEST SEATTLE ART WALK: You can be part of it in January, February, March – if you jump in fast! You’ll soon see that poster around West Seattle – it’s the official poster for the West Seattle Art Walk first-quarter dates (first Thursdays as usual – January 11, February 8, March 8), featuring art by George Perrou. Every quarter, there’s also a venue map/list, of retailers, galleries, restaurants, etc. that agree to be open late that night while hosting an artist and/or offering food/drink specials to make it a more-memorable night for folks out exploring West Seattle. Wherever you are on the peninsula, there’s still time to get on that list for the first-quarter Art Walk nights if you do it here no later than New Year’s Eve (Sunday)! Merry Shop Late Thursday to all, and to all a good night! The Easy Street Records marquee, by the way, reminds everyone that Caspar Babypants is live in-store Saturday at 6:30 pm – and right outside at the Farmers’ Market on Sunday, bring coats for the donation drive AND catch the Santa Trolley nearby – more on the Hometown Holidays page. The next huge Hometown Holidays night in The Junction is tomorrow (Thursday, December 14th) – when the December edition of the West Seattle Art Walk happens on Shop Late Thursday, which means many reasons to be there! Including Santa – roaming! – and caroling by Silver Belles, 5-7 pm, starting at Cupcake Royale at 5, then to Wild Rose, and then wandering between other Junction businesses. Here’s the latest Shop Late list from the Junction Association. Art Walk highlights, running from 5 to late, are here – including the Mug Show at Click! Design That Fits (WSB sponsor) and the Puny Picture Show at Wallflower Custom Framing. You’ll also want to visit Emerald Water Anglers (42nd/Oregon; WSB sponsor) tomorrow night for the shop’s holiday party and sale. And of course the Art Walk stretches beyond The Junction – if you wander south, for example, you can shop for holiday wine at Viscon Cellars (5910 California SW; WSB sponsor) while meeting and seeing the work of artist Sandy Simpson. Venues to the north, too – see the map above! Lots of other places to stop and shop/browse/admire, too – see the rundown here – and be sure your calendar has a reminder for the big holiday Art Walk next month, December 14th! THURSDAY: West Seattle Art Walk, with grand openings! | Comments Off on THURSDAY: West Seattle Art Walk, with grand openings! Yes, we know the Seahawks are on Thursday Night Football. Don’t let that keep you home – you can check in on the game while exploring one-of-a-kind events along the West Seattle Art Walk starting at 5 pm. Though the map above focuses on The Junction, the list next to it shows the venues ranging beyond – from Admiral to Sunrise Heights. Again this month, some are open with artists, some with food/beverage deals, some with both! See the full highlight list here. In The Junction, The Davis Group has a food drive going at the John L. Scott West Seattle offices (4445 California SW) – bring nonperishable-food donations for the West Seattle Food Bank, and check in on how the game is going – they’ll have it on two big screens. … Also in The Junction, Click! Design That Fits (4540 California SW; WSB sponsor) has a mug show … perfect for early holiday shopping. And that’s another place you can bring your own gift … donations for the Shelter Jewelry Project.